I honestly don't know why I never thought of growing my own fresh herbs. Was I too busy? Did I think it would be too difficult? I guess I was so accustomed to using dried herbs that I just did not think to take the next step up to fresh herbs. I was sure missing a lot of flavor and healthy benefits. My fresh herb adventure began in February when I bought parsley, oregano, thyme and basil seeds. I took small pots, filled them with a good quality potting soil and planted the seeds as directed on the seed packages. I placed the pots on a rack in front of a sunny, south facing window and kept the soil consistently moist. After a couple of weeks I noticed the seeds were sprouting. The basil seemed to sprout first and the thyme, oregano and parsley were a little slower. After a couple more weeks some of the small sprouts were dying off and it seemed like the strongest ones were surviving. I backed off on watering to make sure I wasn't watering too much. It took about 2 months but my herbs were finally on their way to becoming successful, strong plants. 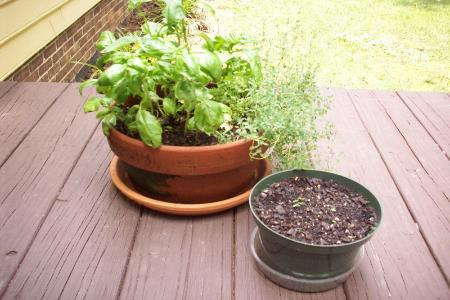 Once the weather was warm enough outside I transplanted the herbs to larger pots and kept them on the deck, close to the kitchen so I could easily pick their leaves. I would have no excuse not to use fresh herbs now! The herbs seemed to thrive in the natural sunlight and rain water. I was very impressed by how easily these herbs grew. I would recommend when first starting your herbs generously plant quite a few seeds to make sure you will have enough seedlings to create large, healthy plants. Consistently water them, make sure they have plenty of sun and you should be successful growing your own fresh herbs. How many ways have I used fresh herbs? The possibilities are endless. Every night I think of which herb would taste good in what I am preparing. Basil is a very versatile herb. I use it in salads, on pizza, in spaghetti sauce, on chicken and chopped on freshly cooked pasta with butter or olive oil. I especially like parsley in rice or potato dishes but it is also good in salads and cooked vegetables. Oregano is a wonderful herb to accompany basil in any dish or salad. Oregano also has antioxidant and antibacterial properties that can be helpful if you have a cold or the flu. Infuse the oregano in water making a tea and sip it throughout the day. Thyme is a wonderful herb and tastes best added to chicken and vegetables near the end of their cooking time. Thyme also has antibacterial properties just like oregano. Since I eat salads every day I love to eat any of these herbs mixed with lettuce, peppers, cucumbers and tomatoes. My advice is to try and grow fresh herbs at any time of the year. You will save money, your meals will be enhanced by their fresh flavor, and it will be very healthy for you. When my mom was first teaching me to garden, when I was around ten years old, she would begin by hauling out the tiller and pushing it in the grass for hours to break up the soil. She came inside sore, exhausted, and overheated. When summer came and the plants were growing, the weeds also grew. They took over, and most of the work we did was weeding Bermuda grass--the gardener's nightmare. That was until last fall, when I started my freshman year of college and began volunteering at the school's farm. While taking a gardening workshop, I learned a new technique that saved us from this torturous work. The technique: no-till gardening. Also referred to as "layer gardening," "lasagna gardening," or "weed-free gardening," this type of garden bed is formed on top of the ground instead of in it. The benefits of this are spectacular. First, the soil in the typical backyard is not going to be very fertile. While it can be made fertile, it takes a lot of work and time. As my instructor pointed out, the soil can also be polluted with chemicals, trash, etc. With no-till, the gardener has more control by choosing exactly what is in their soil. Second, as the name suggests, there is no tilling whatsoever, which not only saves your back but is also better for the ground and beneficial worms. Here's how it works. The first step is killing the grass by smothering it, rather than using harsh chemicals or a tiller. First, you need to cut the grass as short as possible, then place layers of cardboard on the ground. The layers must overlap by several inches, otherwise the grass will find its way between the spaces. The cardboard not only kills the grass, but it also attracts worms which will break up the dirt. Next, make a boarder for your garden to keep the soil in and the weeds out. You can use any boarder you like, such as cinder blocks or wood. I have seen raised beds made from wood panels that are a few feet high, but they don't have to be that tall. I like to keep it cheap. 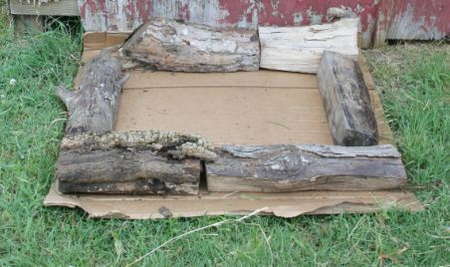 For one bed, I used old firewood and for another I used limestone rocks that I found in construction zones. Once you have made a boarder, water down the cardboard and begin piling on some compost. This can be either fully or partially composted. It will eventually break up with the cardboard, and it will be excellent food for the worms and plants. For the workshop, we used coffee grounds, but that is only recommended for plants that don't mind acidic soil. You could also use vegetable cuttings or any other composting materials. When I did this at home, I used manure and wood shavings from our horse stalls. Continually water down the garden bed as you go. In the workshop, we then added worm compost. At home, I did not have worm compost available, and so I used fully composted manure. You could find compost fairly cheap, but, if you have the time, you can prepare your own with manure, vegetable, and/or paper ("brown") materials. Leaves are also great for composting. This is not only free but is also pretty fun. We then mixed the compost with perlite to keep it evenly moist and then added some top soil. Depending on what you're are planting, you may not need this. Add whatever materials are necessary for what you are planting. 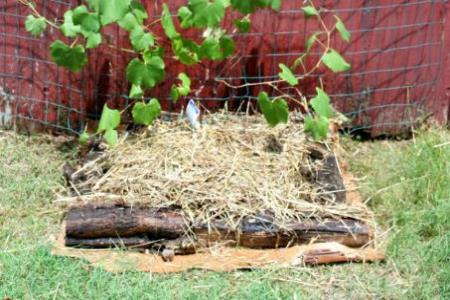 After we wetted our bed, we layered some wet straw (could also use hay) around the edges to keep the structure together. Because the bed was higher than the border, the straw kept it from spilling over. All we had to do after that was plant and surround the plants with straw. If you transplant, you simply have to bunch the straw as close as possible to the small plants, but if you plant seeds, especially small seeds, you will have to give them a little more space. As the layers break down, the plants will benefit from the lower materials. The cardboard will disintegrate over time, and the worms will have loosened the soil enough for the roots to develop. If you layered the cardboard correctly, you should have little-to-know weeding. And there you have it--a no-till, no-weeding, and perfectly fertilized garden. Impatiens walleriana are flowers that my mother and grandmother have always planted in their gardens, and I was attracted by their summer-long color and affordable price so I picked some up during my trip to a local garden center. After I checked out, I looked at my receipt and noticed a warning about downy mildew infecting Impatiens walleriana. I became curious and decided to find out more. What is Impatiens Downy Mildew? Last summer, in many states, Impatiens were killed by downy mildew (caused by Plasmopara obducens). Downy mildew is a pathogen that is spread through air and water, and can stay in the soil for years, making it unwise to replant impatiens in the same beds. If your impatiens are damp for long periods of time, they will be more susceptible to contracting the mildew. Other contributing factors are the weather as well as the density of your planting. Impatiens that are numerous and close together are likely to spread the mildew to one another, and closely planted impatiens may take longer to dry off after a watering due to less overall air exposure. Cooler temperatures also promote the growth of this mildew. The number of states impacted by Impatiens Downy Mildew increased significantly from the year 2011 to 2012. A map at http://www.todaysgardencenter.com provides a visual of the spread. 1. Your impatiens will begin to appear as though they need water; they may droop. 2. There may be a white or gray fuzzy coating on the underside of the leaves. 3. Leaves may begin yellowing. 4. Blooms will begin to thin, and eventually stop. 5. Leaves and flowers will be depleted from plant. Unfortunately, if your impatiens have Downy Mildew, this is their end. It is important to carefully dispose of your impatiens when you remove them from your flower beds, which you will want to do if they are infected. Do not put infected impatiens in a compost pile or in any area where they will rot among other plant life. This can increase the chances that it will spread. Instead, you can put your impatiens into a garbage bag or even burn them. Impatiens that are not showing signs of Downy Mildew but are near impatiens that are infected will need to be removed also. Once your plants are infected, the soil that the impatiens are in will be able to spread the mildew to newly planted impatiens. Because of this, you will not want to plant impatiens in beds that have had infected flowers in them in the previous season. You may even want to wait a few years before you consider planting impatiens in a once infected area. Fortunately, you can still plant in this area. Pansies, begonias, and violas are some examples of flowers will all bloom in the same shady environment as impatiens, but will not contract downy mildew. There are different opinions about treating the bed with fungicide as a preventative measure. It is recommended that fungicide is used by a professional, and that you do not try to treat the mildew with a fungicide because it will be ineffective. It is suggested that if fungicide is applied, it is done at the beginning of the season rather than the end. There is hope for people who have dealt with downy mildew on their impatiens, because breeders are working to develop resistant impatiens that are not susceptible. 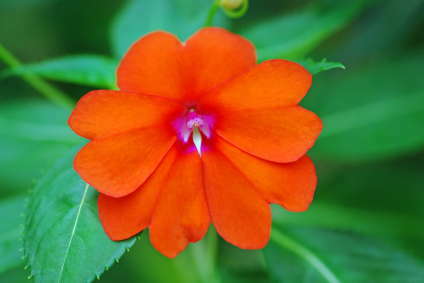 If my impatiens get infected, I will keep my eye out for these new breeds in the coming seasons and explore other options for my shady garden beds. Sarah is new to gardening and eager to share her discoveries in hopes of clarifying the process for fellow beginners. Her other hobbies include making art, baking and exercising when she isn't busy studying for her Master's Degree in Social Work.